Tales of a summer with a 91 (now 95!) year old: All good news! So, Gertie is astounding about everyone here at Shady Grove hospital. She had her throat test yesterday - the day before, she couldn't swallow properly. Liquid was seeping into her lungs with each swallow, hence the pneumonia. So, we had to add thickening powder to all liquids - even water. And, she had to be spoon fed (I gave Carina a raise on the spot...). Anyway, when they took her down for the barium throat swallow test, I got to watch. What an amazing thing to observe. There on the screen ahead of me was my mom's skeleton in all its bony glory! And it was moving! Never seen anything like it - was fully fascinated. So, they started her on swallowing the thickest barium of the test - all went down perfectly. They moved over to nectar thick - all went down perfectly. They tried her on a saltine cracker - you got it. All went down perfectly. The hardest of the test was pills (we had to crush all her pills the day before and mix them with applesauce for her to swallow). Anyway, the barium pill went down without a hitch. We were released from any thickeners! Yep, back to regular food (no pureed in our future, thank you Lord), water, coffee. Everything back to normal. What a huge relief. Although it's hard to imagine this next statement, it's true: This hospitalization has been a blessing in disguise. 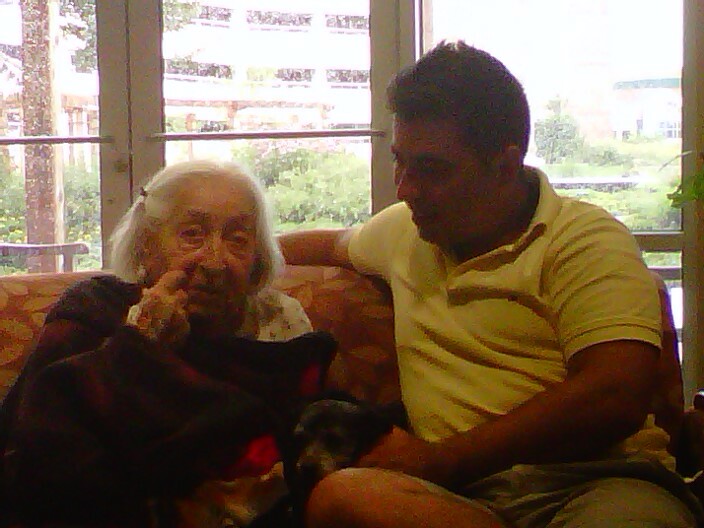 Evidently, mom's had some sort of infection for a while but it was undetected. The doctor I usually take her to just told us that it was normal aging. I remember thinking that "normal aging" doesn't happen overnight and that's about how quickly her mind dimmed. Literally within a week, she was grasping for words, her personality shifted, she was agitated easily, etc. That's not who my mom is. She's the most easy going, funny woman in the world and she's baaaaaaack right now! The IV drips of antibiotics are kicking whatever it was she had. She's fully alert, curious, interested in her surroundings and, in fact, last night, she held court with a bunch of friends in the family center right outside her room. Carina's husband, Liandro, brought mom a flower and she couldn't have been cuter with him. They clearly have a mutual admiration society. Bobbi came up, Jeff stopped by. John's boss, Al and his girlfriend, Michelle, came over for a visit. John brought Gizmo to the front of the hospital where I stashed her in a carry on and surprised mom with a doggie visit. Mom was so cute! 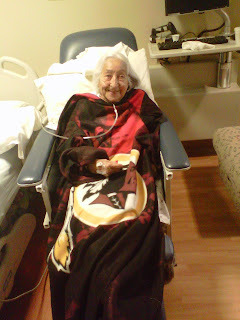 Everytime the door to the family center opened, she or someone would cover Gizzie with a blanket. At one point, we were all back in the hospital room (sharing a box of wine, no less) and the nurse was coming in the room so I stashed Gizmo in the bathroom. All was well until she let out a very small whine. The nurse looked up and I said I was sorry, I had a bit of gas and ducked into the bathroom. Bobbi recalls that she almost peed her pants. Everyone has been so helpful - friends and family and nurses, oh my. Big brother Mike is coming into town today, and I'm sure mom will be excited to see him. He's here until Wednesday so at least we'll get to see him one night at the house if we get discharged Tuesday. John couldn't be a more supportive "spouse" (no, we're not married but "significant other" doesn't cut it for what he means to me). He ran out last night and brought me a delicious shiskabob dinner from across the street. He's holding down the home front and taking care of the house and dogs while we're here in the hospital. Anyway, all is very well here. They took out mom's catheter yesterday, but I was sure sad to see it go as that meant bathroom duty last night - a few times. Eh, it had to go though as infections loom from catheters. All in all, it's a very good day at Shady Grove hospital today. More updates as events happen. Wish us luck - I'd sure like to bust her out of here before Tuesday! Very very good news. Mom 2 is a really tough gal isn't she:) Big hugs and kisses to her from me. And some for you too. And by the way, I couldn't agree more that you (and I) consider our guys as Spouse no matter what the institution of marriage says about it. Yay! I'm so glad the hospital stay has turned into a real turnaround for Gert. Wonderful!!! Ladies, I'm so grateful she's here with me. We really thought it was about to be very very bad but it's amazing. She's just my old Mom again.